QR code is a matrix code (or 2D barcode) was developed y Denso Wave (Japan) in 1994. It abbreviated from Quick Response Code that can read and understood by the code or QR code scanner, or any smartphone with QR barcode reader application. QR code used to track parts of car production, now it used for various industries. Recently, QR code reader - as a mobile application with a camera to scan the code and deliver the information. What mobile application can use for QR reader? User can use "i-nigma" for any Apple devices and Barcode scanner for Android devices. In general, QR code is one form of alternative encryption briefly certain string e.g. URL, address information, phone numbers, or any information you want to put in. QR code is used quite popular around the world for many years and it is the most commonly used to identify the brand. Most of the lengthy information, high cost printing have been replaced by QR code. How does it look like? QR code is a square block with internal character code as the image below. The traditional bar code, the kind that you often see on the most products in supermarkets, with straight lines it can show up to 20 digits. While QR code can encode the number of character more than it 350 times, QR code store and share large amount of date, with the ongoing development of the smartphone with the ability to handle large date sets. When you receive a brochure, you are interested and want more information on its website, QR code is available at the corner of the paper and all you need is open your QR reader or any mobile application to scan QR code that can access the website. It's convenient and you don't need to open your browser type the website address. You receive a name card from your business partner and you want to save all the information into your smartphone, it would be time consuming of you type all information needed. So just put a QR code, scan on your smartphone and you have all this information. For individual, you want to publicize your personal information but you worry about the harassment and fraud. 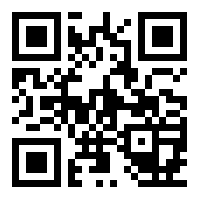 Just make a QR code and share with your friends.